When I joined Compel Training online over a year ago, I didn’t know that I would find a kindred soul in writing or that she would live in Louisiana. Ellen has comforted me, cheered me, critiqued me and loved me as a dear friend should. The first time we met over cornbread and biscuits at Cracker Barrel in Alexandria, we became fast friends. She’s a tiny little thing that is big in compassion and Jesus. Enjoy her today. The hair on the back of my neck stood up. I was alone in the office, and suddenly had the heebie jeebies. It was not uncommon to hear an odd thump or squirrels scampering on the roof, but this felt different. I turned my chair slowly, expecting to see someone staring at me. Instead, there was a snake slithering up the window. Thankfully he was outside! He wasn’t exactly moving, more like resting, circled around the large window pane a few times, just hanging out. I beat on the window, causing him to hiss-s-s-s and stick out his tongue. It was red, by the way, just in case you wanted to know. Yes, I got that close but, only because there was a double paned window between us. The next morning, BC (before coffee), I felt the same sensation of being watched. Running the water for my shower, I looked up and saw a huge tree roach peering at me from behind the shampoo bottle. He was at least three feet (inches) long. Growing up, I could always count on my Daddy to come running and kill those pesky bugs. NO MATTER what time of day or night. Alas, this was 5 a.m., and as much as my hubby loves me, I knew better than to wake him for a roach killing. Since I don’t squash those things (ewwww), and I had no swatting tool or bug zapper handy, my choice was clear: I had to drown him. Fifteen minutes later and no hot water left, I won. As I pondered creation that morning, this came to mind: We are created in God’s image (Genesis 1:27). Not the nasty bugs, or slithery snakes, or even the cute little kittens. We are. You and me, bearing His image for all the world to see. 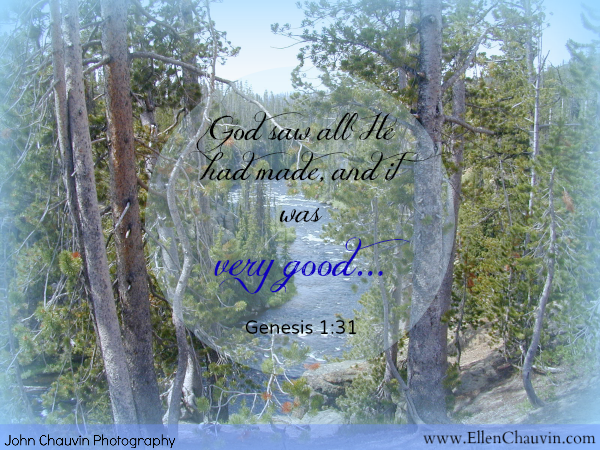 God considered us a “very good” creation, His masterpiece (Genesis 1:31 and Ephesians 2:10). In creating us, He chose us. The meaning in the original Hebrew is to select or to cut down. Imagine an artisan woodworker, wandering through the forest. He examines the trees, looking for THE perfect piece of wood. He envisions exactly what he’ll create. His mind’s eye sees the beautiful bowls, tables or decorative art. Each piece will be unique: a slight turn of the lathe here, a deepening of the grain there. Each a reflection of the master artist, an expression of his very soul. And so it is with us. God chose us, seeing the potential in us. He chopped us down and cut, carved and sanded until we bore His image. Because we are uniquely created by God, we each radiate with a different, distinctive likeness of Him. For years, I didn’t appreciate the uniqueness of others. I couldn’t understand how they could do something THAT way, when obviously my way was better. Thankfully, as I’ve grown and matured, I’ve learned to be grateful for our differences. One friend would have found a shovel and quietly, but heroically, taken care of the serpent. You killed it, all by yourself? EWWW! Another would have captured and released the nasty crawling insect, saying “Fly away little bug!” You let it live? EWWW! Through each of them, I have come to know Christ in different ways. I have seen His quiet, controlled power and His gentle mercy. Next time I think someone is “a little different,” I will narrow my eyes and look more closely. I’m pretty sure I will glimpse our Master Creator. Ellen is an ordinary wife and grandmother, who loves the Lord and His Word. She does ordinary things like work, grocery shop, and laundry. She loves to read, write and make homemade salad dressings! She is a nature lover, and would rather be outside writing and dreaming than be stuck inside with laundry. 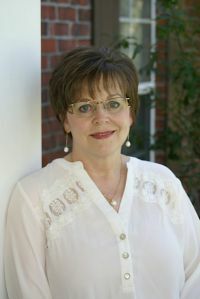 Ellen is passionate about scripture, and enjoys sharing the truth of God’s word. You can find her blogging at Ordinary, with a Splash of Flash, where she encourages ordinary women to walk in extraordinary faith. She lives in South Louisiana with her husband John (her personal blog photographer!) and their goofy cat Callie. I’ve taken an axe to snake before, even put a glass bowl over a little one that got in the house and instructed the boys to fill a ziplock bag with ice to put over the top. The cat watched it the entire time until “Dad” got home from work. I think being a mom of 5 sons made me step up to the plate – I couldn’t just run screaming with them watching. They’d never let me forget that. Don and Katie Fortune’s books on Spiritual Gifts really helped me understand differences and see the blessing in those differences. It changed my life – and made me so much more comfortable with other people! BTW – I will admit – I’d rather take an axe to a snake than meet a 3-4 inch bug!!!! What a funny story! But I can’t imagine leaving a snake in the house, even temporarily, with a bowl over it! Thanks so much for the book recommendation. I will definitely check it out! Heehee! This reminds me of the wide variety of critters we’ve had in and around our house this year. I’m one of those ‘carry it outside and let it go free’ girls:) Fun post, Ellen! Would love to see you girls. Blessings! Oh Kristine, you wouldn’t! But if so – that’s ok! Glad you stopped by to visit on Carmen’s back porch! I would love to see you too! Maybe we can have a LA/TX meet up soon, and talk about writing and life! Hey sweet Kristi! Thank for your welcome here. I love my sweet friend Carmen, and am happy to she opened her home to me! Thank you for your encouraging comments, and like you, I look forward to full understanding the day we get to Heaven! Awe, two of my favorite Compel sisters <3 . Awe Brenda! Thank you sweet Compel sister, I’m so glad you stopped by Carmen’s place! We love having company and Talking About Life! Each time we look at someone a little different we should see another beautiful masterpiece. Thank you Ellen for sharing your words with us today. Thank you, Carmen and Ellen. Ellen, I love that our Master Creator is in each of us, no matter how different we are. I think I would have hurried to get my camera for both the snake and the bug. But the huge tree roach INSIDE MY HOUSE, I probably would have yelped first… :) I love the photograph! Trudy, you’re a brave woman to run for your camera first! Believe me, I did a bit of yelping on both. It was a great reminder for me that we are to bear with one another in love – no matter how different we are! Thanks so much for your encouraging comment, and for stopping to visit!